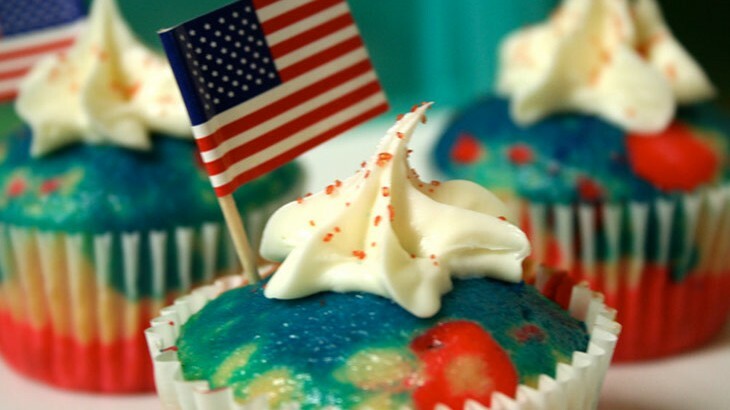 It’s America’s favorite summer holiday: July 4th! On this day we celebrate the signing of the Declaration of Independence, in which the American Colonies declared themselves independent from Britain. Typical 4th of July events include parades, rodeos, and concerts. Check local calendars and listings well before the 4th to find out what is happening. Typically, many western states (Colorado, Wyoming, Montana, Texas, etc.) have July rodeos. Most major cities and towns host a 4th of July parade or concert of patriotic anthems. It doesn’t have to be the 4th of July for Americans to fly their flag, but it certainly helps. You can get in the spirit by flying your own flag, or you can even dress in red,white, and blue. Almost every culture in the world has a tradition that centers around fire and meat, and the USA is no different. Our version uses a grill with either gas or charcoal and the featured items are usually hamburgers and hot dogs. Americans like to drink beer with their grilled meat, and popular side dishes for summer barbeques include corn on the cob, potato salad, pasta salad, and pretty much any other variety of salad you can imagine. After eating burgers and drinking beer, head to your local fireworks show. You will need to check the newspaper or online calendars to find out when and where to go. Some cities and towns opt for showings on the 3rd or 5th of July. We only recommend doing this if it is legal in your state! Different states in the USA have different laws about setting off fireworks. If your state allows it, this can be a fun evening activity in your neighborhood or local beach. No summer party in the USA is complete without an ice cream cone. The lines can be long at ice cream shops during the 4th of July holiday, so go with friends to kill time and chat. No matter what you end up doing, have fun and enjoy this festive time in the USA. It is a great way to meet new people, celebrate together, and learn about the local culture. Denver, Colorado, esl-blog Colorado, Cultural Activities, learn English, Study English in the USA. permalink.